Understanding your tax obligations can be confusing. The tax code is enormous and complex, and there are always exceptions and addendums to consider. Working with a tax lawyer is the best way to understand your rights and responsibilities, but the IRS also provides assistance when you have basic questions. You can take care of a lot of simple issues by just contacting the right resource. You can also call the office at 602-636-9199. The Phoenix IRS office is open Monday through Friday from 8:30 a.m. to 4:30 p.m. Unfortunately, many people lose their real estate each year in Phoenix and throughout Arizona because they don’t (or can’t) pay their taxes. The amount they owe is compounded by penalties and interest, and pretty soon, they are unable to get out of the hole they are in, no matter how hard they work. You can find a listing of all properties being auctioned to meet tax debts here. The properties are listed by type, such as antique shops or industrial sites, and they are labeled by their location. You can find properties in Phoenix and throughout Arizona that are being auctioned for tax debts. The page also provides plenty of information about the tax regulations surrounding the seizing of property to satisfy tax debts. There are links to frequently asked questions, federal regulations, the Treasury home page, and more. Sometimes, the IRS brings suit against taxpayers who are in default or who they believe have committed fraud or other criminal wrongdoing. When the IRS files suit against taxpayers in Arizona, you can find that information on the Justia Dockets and Filings page here. The page has a listing of recent filings that shows the case name, filing date, and basic details like the defendant and plaintiff names, cause of action, and the court in which it will be heard. You can click on the case name for more details such as the judge name, county, and more. You can search the Justia listings or browse them in table format. You can also subscribe to them in an RSS feed so that you never miss a listing. There will be plenty of times when you just need to have your questions answered or need a little help from an IRS representative. You can make an appointment with the local Phoenix office by calling 844-545-5640. At the local office, you can get help with a letter you may have received in the mail, ask questions about wages being taken, change your tax information, make payments, get basic tax law assistance (not help with putting together your return), and much more. You can also get any forms that you might need to file your return, as well as ask questions about specifics on any form. You can find a complete list of the IRS offices in Arizona here. The IRS tries to make offices available for all citizens so that they are relatively easy to access. That means that you may not find an office right around the corner, but it shouldn’t be too cumbersome to get to an office. You can also contact the Taxpayer Advocate Service for more help with your tax issues, but we advise talking with an experienced IRS lawyer. 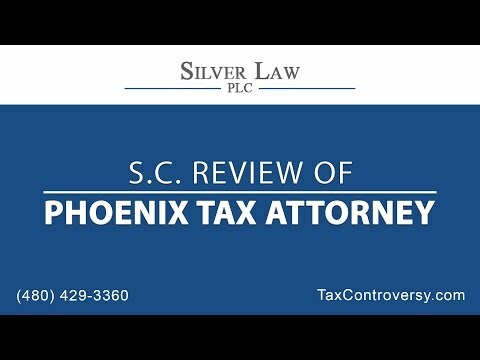 Silver Law PLC in Phoenix can help you with just about most tax issues you may be facing, from audits to litigation. We represent both individuals and corporations throughout Phoenix, and we help clients protect their rights and minimize their tax liability. From innocent spouse relief to foreign tax reporting, we handle it all. Our experienced tax lawyers in Phoenix have all worked as prosecutors for the IRS, so they have a special understanding of how to defend you against the IRS. Do not put your finances or your future in jeopardy. If you have a tax issue, call us to work with an experienced IRS lawyer in Phoenix who will help you.